According to reports from Weather Underground, Greenland experienced its hottest temperature ever recorded on July 30th, 2013. The new record, 78.6 degrees Fahrenheit, was measured at Maniistoq Mittarfia on the western coast of Greenland near Baffin Bay. 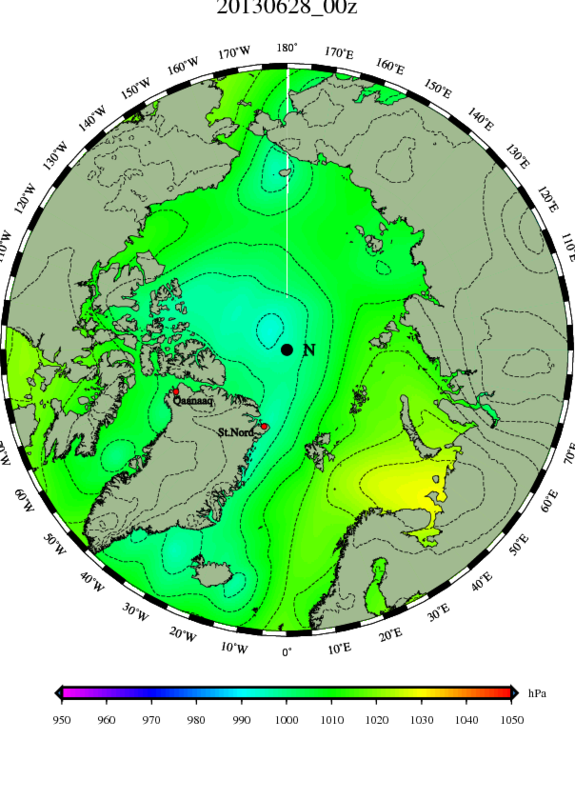 The event occurred during a period of rapidly increasing Greenland melt as a high amplitude wave in the Jet Stream surged over Greenland, pulling warm air up from the south. This southerly flow set up conditions for what is called a foehn event — a warm, dry airflow that occurred in the slopes of Greenland’s western mountains. 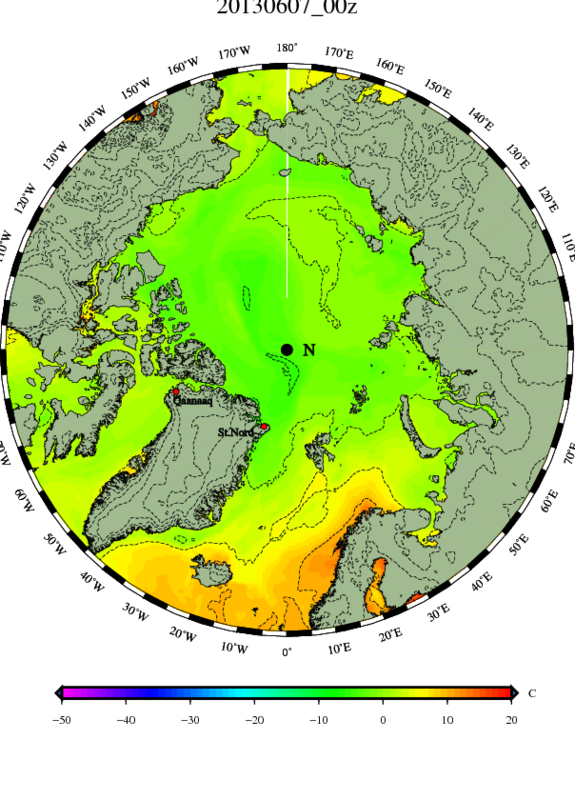 This associated warm flow amplified heat over a broad region of Greenland, creating 2013’s largest melt spike, even as it set new temperature records. The previous record was 77.9 degrees (F) which was set in 1990 at Kangerlussuaq on July 27th. 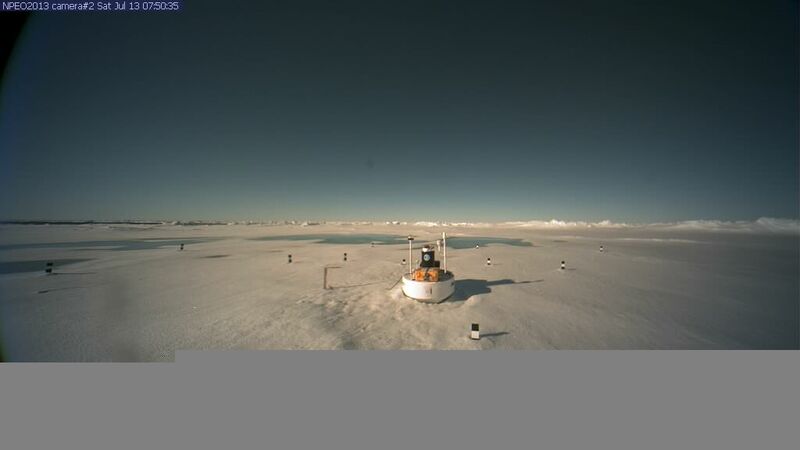 As Greenland was experiencing its hottest foehn wind event ever recorded, a number of Arctic specialists were putting together the above video summary explaining how the Greenland ice sheet has sped up in recent years. Peter Sinclair, Jason Box and other experts provide an in depth analysis of this planet-shaping event in the video above. Live filming occurs at the site where a large melt pulse from the Greenland ice sheet washed out a bridge, road and threatened a nearby airport during the record 2012 melt year. 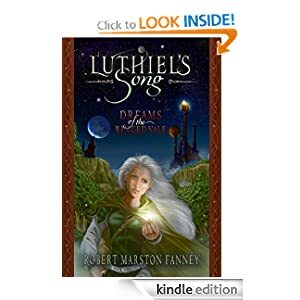 In order for such an event to take place, the speed of Greenland’s ice sheets would have to greatly accelerate. The fact that we are starting to see the early stages of such an acceleration is not cause for comfort. 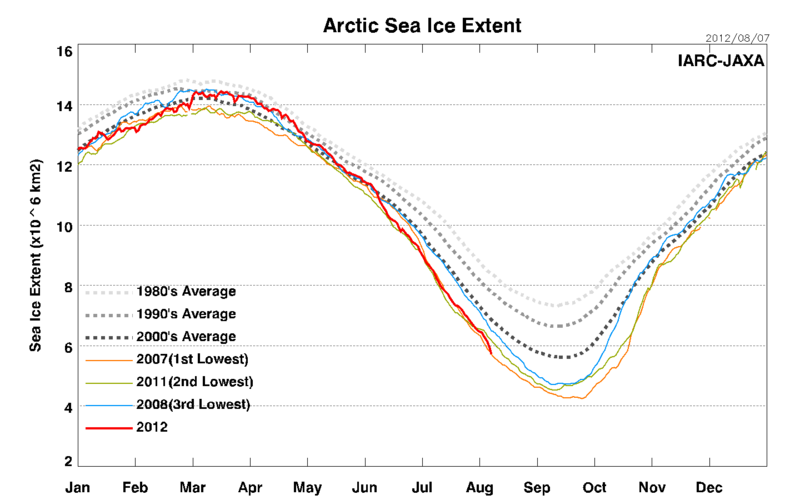 Since August 2nd, we’ve been reporting on the potential for a new record low in sea ice area and extent for 2012. And since that date, the Arctic has lost unprecedented volumes due to melt. Strangely, as if on queue, a powerful storm formed in the Arctic late on August 5th and has since churned through the ice pack, further accelerating melt. The low formed on August 5th in the East Siberian Sea. It quickly grew into a powerful cyclone with 35 knot winds, pushing 10-12 foot seas. It then tore northward and is now wobbling near the pole. Forecasters expect it to linger through today before weakening. The forecast following this powerful storm is for warm weather and strong winds. Strong storms of this kind are rare in the Arctic, especially in summer. But they do have a dramatic impact on sea ice. The powerful wind and wave action generated by these storms mixes the water column, bringing warmer water up to the surface. It also breaks ice flows into smaller bits. Finally, powerful storms can tap into warmer air to the south, drawing it in behind the storm. This one, two, three punch tends to result in rapid melting following these events. 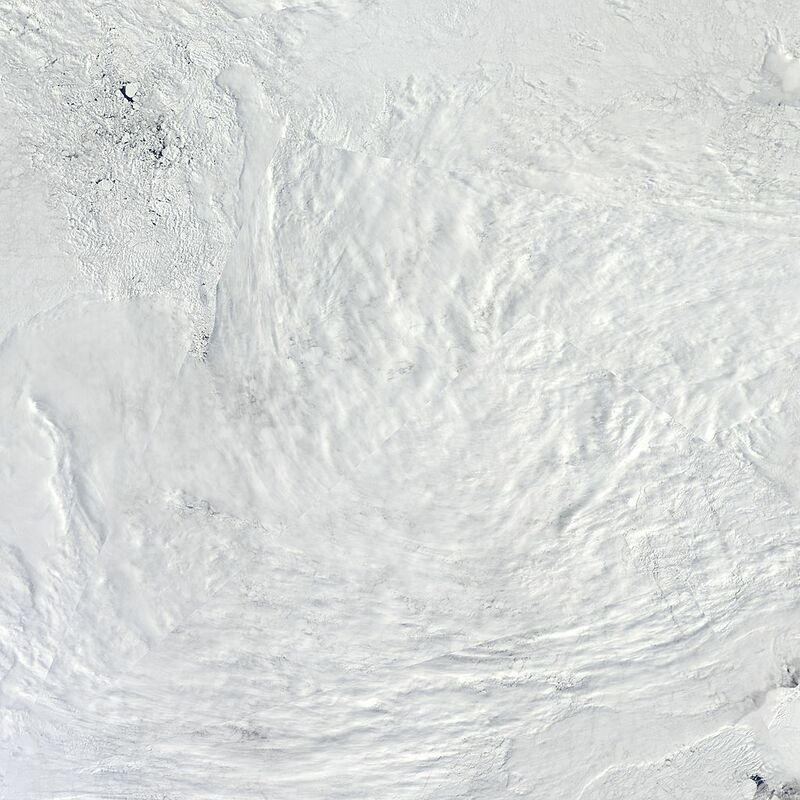 And given the already fragile state of sea ice this year, the current storm appears to be delivering a coupe de grace to the ice sheet. 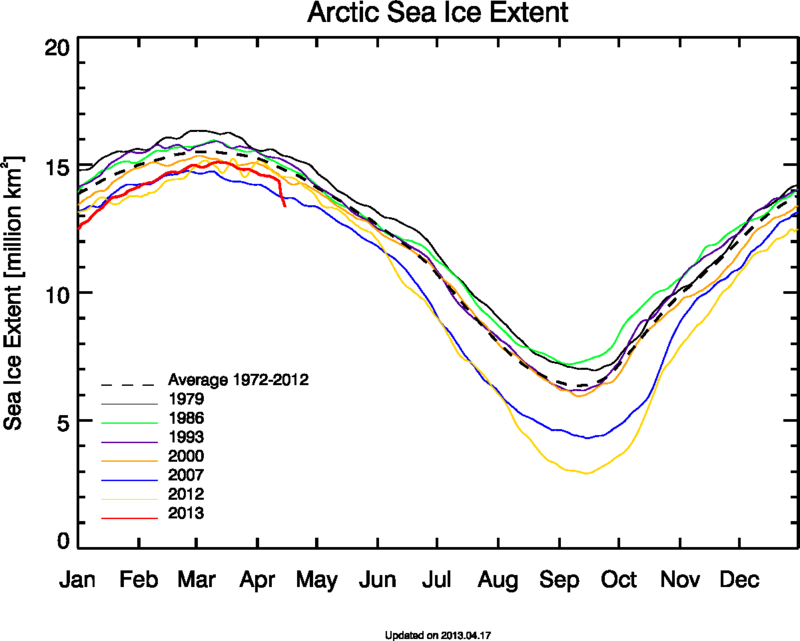 You can view this rapid ice loss in the sequence provided by Cryosphere Today above. Looking at the ice’s motion, it appears that the main ice sheet is pulling away from stranded ice left in the East Siberian Sea, creating what appears to be a growing gap between these ice packs. 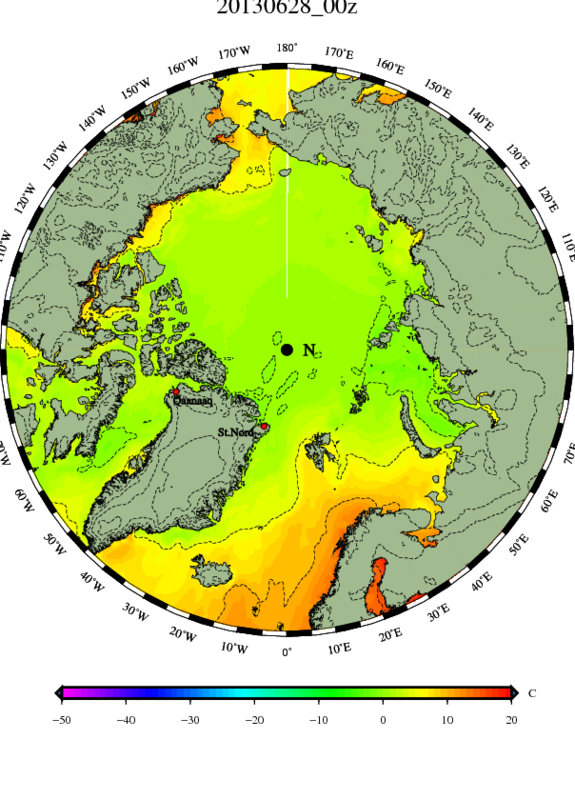 This kind of a break-up is very rare for the Arctic Ocean and we are probably witnessing something that has never been seen before in the satellite record. 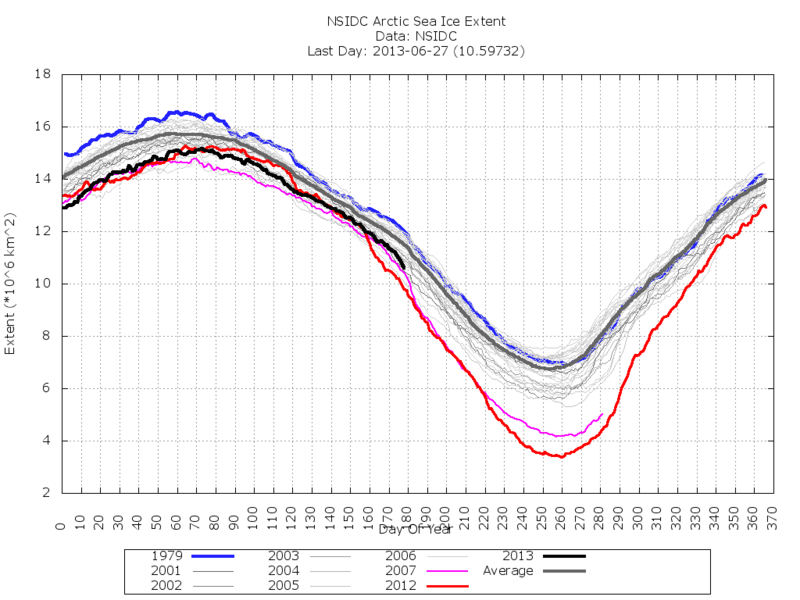 Overall, first indicators are that this storm has delivered a powerful blow to Arctic Sea ice. 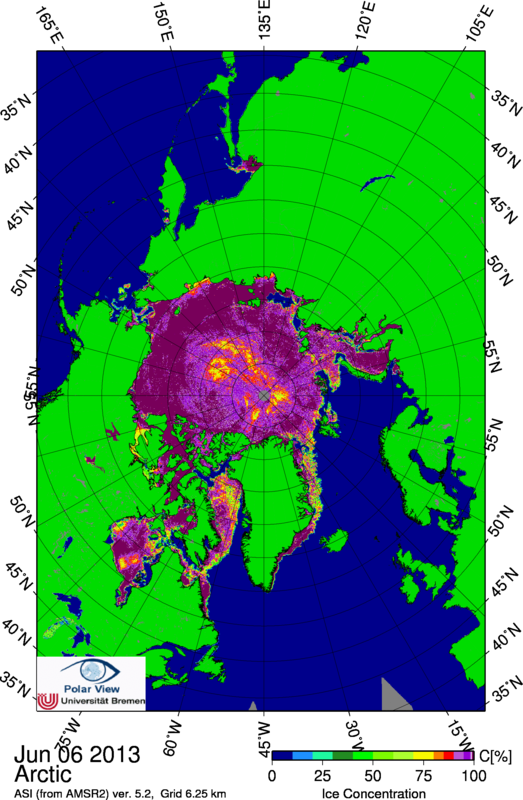 Cryosphere Today is showing a loss of 310,000 square kilometers of sea ice since we began reporting on the potential for record melt on August 3rd. 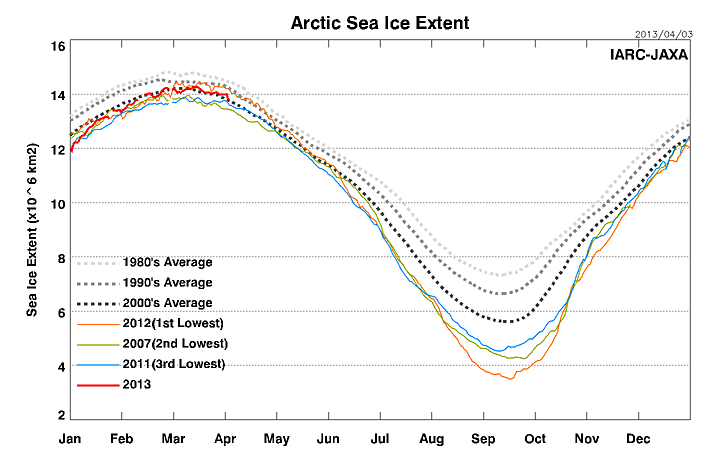 That’s a loss of nearly 80,000 square kilometers of sea ice each day. 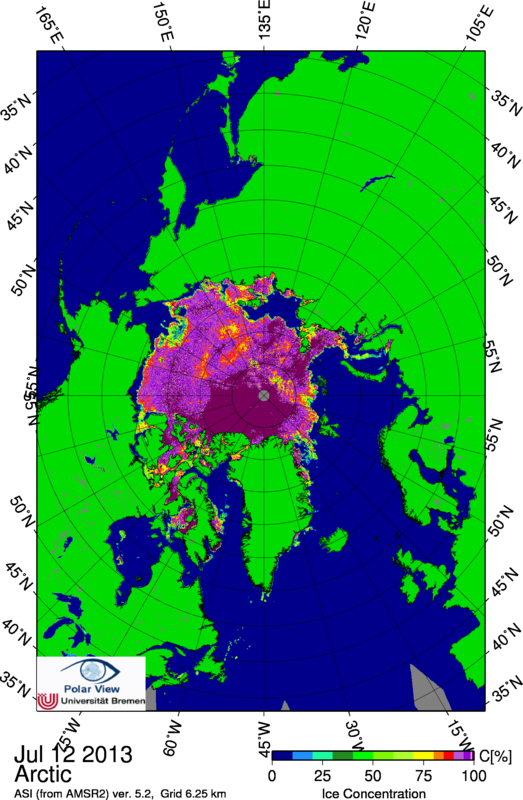 Currently, Cryosphere Today is showing sea ice area at 3,480,000 square kilometers. This is about 500,000 square kilometers above the previous record low set in 2007. 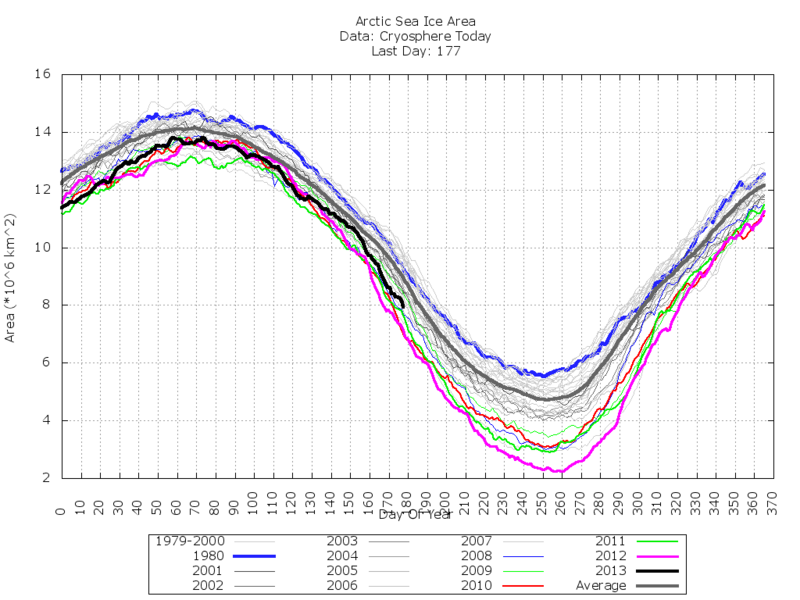 At the current rate of melt, it would take less than a week for this record to be breached. With the most recent turn in the JAXA chart looking like the edge of a cliff. Forecasters expect this cyclone to continue today before finally dissipating sometime after 24 hours. Afterward, forecasters are calling for warm and windy conditions. These conditions are likely to support continued rapid melt over the next few days.